A must for home canners and gardeners! With the Roma Food Strainer/Sauce Maker you can quickly and easily make healthy homemade sauces, soups, jams, pie fillings, jellies, wines, juices and even purees for baby foods from just about any fruit or vegetable imaginable. No more peeling or coring! 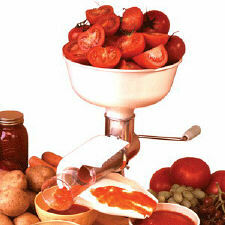 The Roma Food Strainer/Sauce Maker does it all for you. Easy to setup and use, it will become indispensable to cooks and gardeners alike. Now you can use fresh ingredients for all of your recipes and never worry about additives or preservatives again.